The US stock markets closed last week with a heavy bout of selling with the most significant falls occurring on the Nasdaq 100, with some of the largest blue chip stocks such as Google, Apple and Microsoft being the biggest losers on the day. Apple stocks were under pressure all day following a less than enthusiastic response to the new Ipad, which received mixed reviews. For technical binary betting traders, the 1735 level looks to be a possible area of support and therefore I would suggest that this could be a good level for a No Touch trade in the next few days. Moving to the forex markets, the biggest losers in the last few days have been the traditional carry trade currency pairs, which are now well off their peak levels of early January. For new currency traders, the carry trade involves trading a low yield currency, such as the Japanese yen ( or more recently the US dollar), against a higher yielding currency such as the Aussie dollar and New Zealand Dollar. 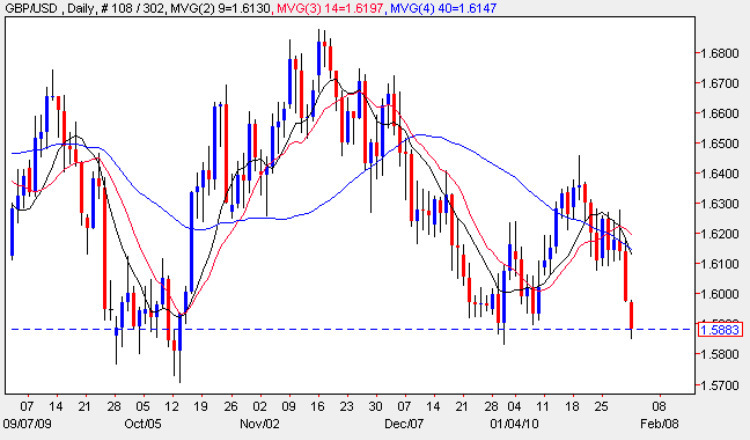 Whilst the carry trade may appear to be a relatively low risk trade, in the last few months these speculative trades have become have become heavily oversold, with the currency traders leveraging positions ever higher – these positions are now starting to unwind quickly, with relatively small moves in the currency causing panic selling as a result. The net result is the Aussie dollar and New Zealand dollar have fallen sharply from their peak at the start of 2010. For binary betting today, the UK pound is selling off heavily in the market as we approach the floor of the recent sideways consolidation, and should the 1.58 level be broken in the next few days, then this could signal the end of this trending channel with a deeper move lower possibly to retest the 1.55 or even 1.50 level in due course. My binary trading tip for today is to look for trading opportunities in the pound vs dollar as we break below the 1.58 price handle, which could happen later today.